Like the baking world has Mary Berry so too has the cocktail world the magicians that work at Peruke & Periwig. Stepping into this small bar on Dawson Street is like stepping back in time. It oozes charm alongside a real respect for the art of cocktail making. I had my first ever Espresso Martini here and it was love at first taste! Don’t go to PYG and expect exceptionally made, handcrafted, unique cocktails. Instead this place offers 2 for 1 cocktails (probably the cheapest you’ll find in the city centre). It also offers buckets and buckets of atmosphere with young people flocking there every Sunday evening when the little lane becomes a street party with a DJ, dancing and yep you guessed the infamous 2 for 1 cocktails! Grab a seat outside and watch the madness unfold! VCC is Dublin’s worst kept secret! Not somewhere you’ll easily stumble across no, no, no this bar is very subtly located in Temple Bar. The entrance is just a black door with the letters VCC on the front. Ring the bell, climb the stairs and be transported to a 1920s speakeasy bar you could only ever have imagined in your dreams! For when you want a cocktail but he wants a pint. This bar is the place to go! Situated on Dublin’s Fade street this bar has one of the best outdoor areas in Dublin. It’s simple, unassuming character adds to laid back chilled vibe. I recommend sitting outside or up by the window taking in the beauty of the old red brick buildings across the street. Located in the heart of Dublin’s Creative Quarter amongst a tonne of quirky boutiques and vintage thrift stores stands the stylish and sophisticated Drury Buildings. This place is an Instagram lovers dream; from their colourful bold exterior to the teal and rose gold interiors. With delicious cocktails to match this is the perfect place to stop after a spot of shopping. Afternoon Tea has become quite mainstream in popular culture with pictures and posts flooding our feeds; from fancy hotels, teapots filled with gin and of course our own vintage buses. The opportunities for afternoon tea are endless. But where did the whole tradition start? And why is it such a fancy occasion? The story goes that Anna, 7th Duchess of Bedford, complained of “having that sinking feeling” between lunch and dinner. These days, she would have been given a protein bar and cup of coffee and be sent on her way but times were different in 1840 and she was, of course, a duchess. So instead a tray of tea, bread and butter and a selection of small cakes were brought to her in her boudoir. Such was the spectacle of the whole thing that she began inviting friends around and before she knew it “afternoon tea” became the thing to do for upper class and society women. I suppose the Duchess was what we’d nowadays call an influencer! By the 1880s Afternoon Tea was so popular that women would dress up specifically for it. They also began serving it in the drawing room of their houses rather than bedrooms. Today afternoon tea is an occasion, an excuse to get dressed up and meet old friends, celebrate a mother’s birthday or just to treat yourself and those you love. If you want afternoon tea with a difference we’d love to welcome you on board our vintage Routemaster bus and take you on a tour like no other. Located in the heart of Dublin’s Creative Quarter Kaph offers what may be the best cup of coffee in Dublin. It’s a small, relaxed cafe with no airs or graces, just really good coffee! Our favourite spot to sit and relax is upstairs looking down on South William Street. Keep an eye for the simple yet striking artwork on their window. Drinking coffee and people watching are two activities that go hand in hand. 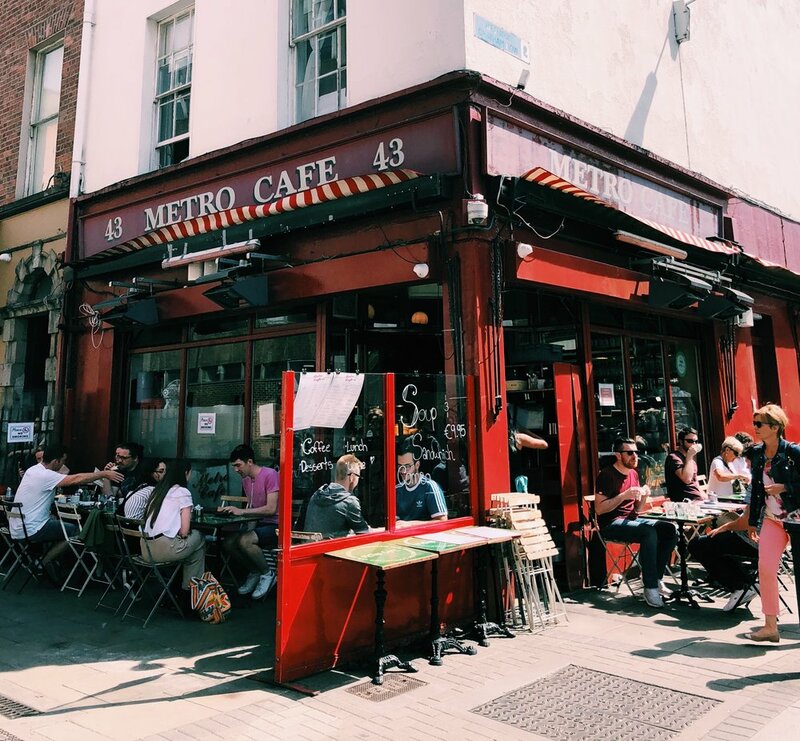 While Dublin isn't known for al fresco dining, the Metro Cafe is one place all Dubliners go to sit outside and watch the world go by. Established in 1996 this cafe is loved and adored by Dubliners and tourists alike. You may have to wait for an outdoor table but we guarantee you, it’s so so worth it. Butlers is to Dublin what pasta and pizza is to Italy. It can be found in most areas of Dublin and never lets you down. Their hot chocolate is legendary and each hot drink purchase comes with a homemade chocolate of your choice. What more could you want? With four locations in Dublin this cafe is taking over. Personal favourite is the one nestled on Trinity Street. The beautiful old red brick building and stunning windows remains untouched giving a more authentic, homey and cosy vibe to the cafe. The beginnings of 3fe coffee is a fairytale love story between one man and coffee. This love and passion can be seen in the respect and attentiveness the baristas behind the counter have for the perfect cup of coffee. It never disappoints and is so popular and respected that it is supplied to numerous cafes around Dublin such as Fallon & Byrne and Kaph. If there’s one thing us Dubs are good at it’s storytelling. We’re a proud country with a diverse, rich and sometimes wacky history. When tourists from around the world come to our fair isle they want to experience this and one place in particular that has got this art of storytelling down is The Little Museum of Dublin! The Little Museum of Dublin is a small museum nestled on the edge of St. Stephen’s Green Park. It’s a charming museum located in a Georgian house which documents the last 100 years of Irish, and in particular Dublin’s, history. It houses over 5,000 artefacts all donated by the people of Ireland. Among these artefacts is the music stand that John F. Kennedy used as a lectern while giving a speech in the Dail and one of the first ever copies of Ulysses ever published in the English language. With so much to do in Dublin this little museum offers a short but informative 29 minute guided tour of one floor of the house (the other two are self guided). So much is jam packed into the tour I found myself wanting to take notes. As a Dubliner, born and bred, I’ve been on many a tour and heard many a story. However, our guide Joan had stories and facts that I had never heard!! One in particular about the ducks in Stephen’s Green had my heart melted (I won’t spoil it for you, you’ll have to find out for yourself). I can’t recommend a trip to the Little Museum of Dublin enough. With each wall plastered with memorabilia, posters and photos from a bygone era, it’s difficult not to feel a sense of pride and nostalgia of what our little country has accomplished. Allow us treat you to a little bit of nostalgia. This is Afternoon Tea with a difference. A massive thanks to RTE & Nationwide for the fantastic coverage last week..
There’s no better way to experience the city than on our Vintage Route Master. Experience our freshly prepaired seasonal afternoon tea and sit back and enjoy the sites of the Dublin City. Nibble away on delicate finger sandwiches, fruit scones with jam and cream and a selection of eqcuisite pastries and deserts. We will take a trip throug hthe city and take in the Phoenix Park, St. Paticks Cathedral, Christchurch, Wood Quay, O’Connell Street, Trinity College, Georgina Dubin, St. Stephens Green and more.